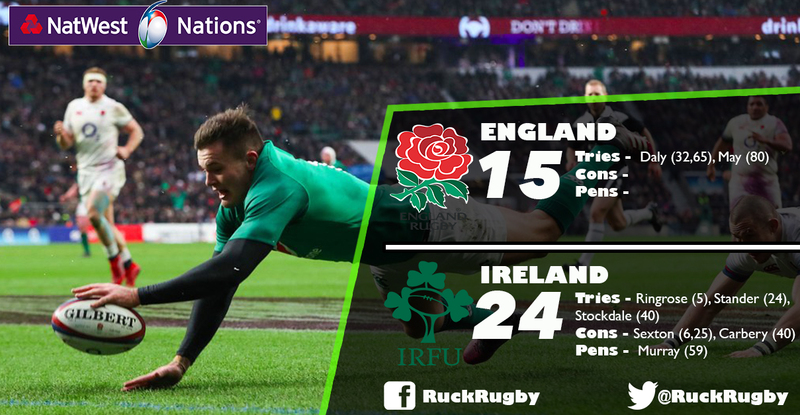 Ireland completed the Six Nations Grand Slam after strolling to a convincing 24-15 victory against England at Twickenham today. First-half tries from Garry Ringrose, CJ Stander and Jacob Stockdale lit up a snowy Twickenham as Joe Schmidt’s men opened up a healthy 21-5 lead despite having Peter O’Mahony in the sin bin. A brace from Elliot Daly and Jonny May’s try with the clock in the red at the end of the game brought only faint consolation for the home side on another chastening afternoon for Eddie Jones.